Christian and Muslim faith leaders have been lauded in the Scottish Parliament for working in close partnership to combat extremism. Cross-party MSPs have signed a motion which recognises the significance of Imam Sayed Razawi, Director-General of the Scottish Ahlul Bayt Society, addressing the General Assembly of the Church of Scotland last month. Imam Sayed Razawi addresses the General Assembly while Moderator, Right Rev Susan Brown, and Principal Clerk, Rev Dr George Whyte listen intently. It was lodged by Bill Kidd, MSP for Glasgow Anniesland, who said the invitation to address Commissioners was “emblematic of the strengthening of interfaith ties” in Scotland between Christian and Muslim people. He added that the relationship between the two faith groups has created a new space for dialogue and cooperation over issues that unite people from all backgrounds. Sheikh Sayed Razawi told the General Assembly that Christians and Muslims represented “different shades of the creator” and must hold hands under the shadow of God and walk together. Mr Kidd said: “The exchanging of ideas are exactly what ordinary people of all religions and none need in this day and age to combat extremists from both the far right and left of society. “The more we can publicise how much we share our common humanitarian ideals, the more we can dispel the view that ordinary believers in religion are poles apart in their views of each other and the world”. 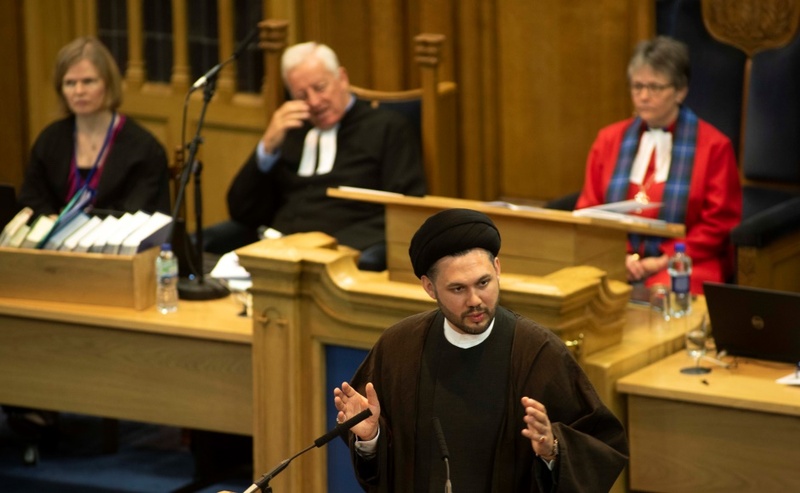 Rev Dr George Whyte, Principal Clerk to the General Assembly, said it was an “honour” to have Sheikh Sayed Razawi address the annual gathering in Edinburgh. “His presence amongst us was a sign of a growing friendship between the Kirk and the Shia Muslim community and our shared commitment to being good citizens and neighbours in a multi-cultural Scotland,” he added. Right Rev Susan Brown, Moderator of the General Assembly of the Church of Scotland, said she was delighted to work closely with the Muslim community. “For me, it’s about knowing the other,” she added. Sheikh Sayed Razawi said the Shia Muslim community is “extremely proud” of its partnership with the Church of Scotland. “Therefore we are delighted that this partnership has graciously been captured by Bill Kidd MSP in this Parliamentary motion,” he added. “It is instances like these that allow for communities to further their bonds. Last month Mr Kidd sponsored an interfaith conference on Genocide Prevention in the Scottish Parliament, which was organised by the Scottish Ahlul Bayt Society and supported by the Kirk. It was led by Adama Dieng, Under-Secretary-General and Special Adviser of the UN Secretary-General on the Prevention of Genocide, who hit out at “cynical” and “manipulative” politicians who exploit fear to win votes.